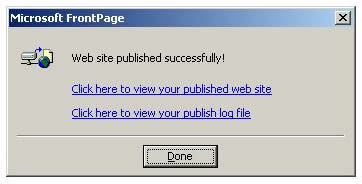 How to publish with FrontPage 2003. On the top Menu bar click on the File menu option. 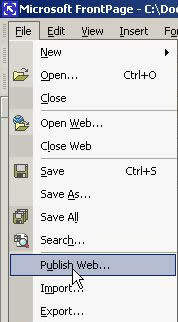 Once the File menu opens, move your cursor down and click on Publish Web option. Note: If the Publish Web command is unavailable, see the Microsoft Knowledge Base. 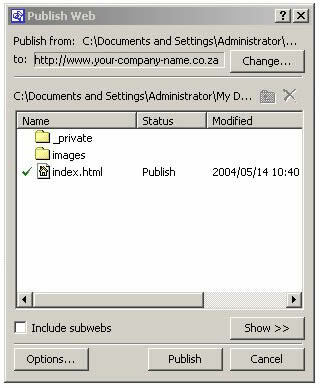 When the Publish Web dialog box opens, type in the path of the destination Web server and then click on the Publish button. 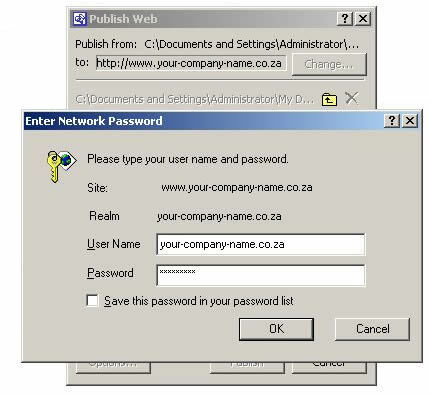 A window prompting you for your username and password should then open. Enter your FrontPage username and password exactly as was provided. We suggest that you copy and paste the details from the source. Note: white spaces. Click on the Ok button. This should publish your FrontPage website to the server. You should receive a confirmation message once completed.